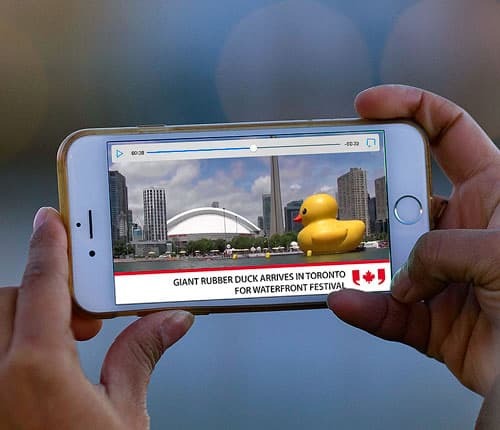 Increase repeat visitors, social shares or engagement time with relevant, memorable video that brings the story to life. Licensed editorial video from across Canada and around the world. We grant copyright permission for you to use video on your digital and broadcast properties from CP and sources such as The Associated Press, and more. Custom video from our national and global networks of freelance videographers, managed by our commercial division and AP Content Services respectively. Clients hire us for video shoots and events, trusting our expertise in filming and producing unique, unforgettable video. How is licensed video different than custom video and what's the best mix for you? Understanding the benefits of licensed video versus custom video helps determine the best mix for your needs. Licensed video brings credibility to your brand and audiences tend to share content from trusted, well-known sources. Custom video conveys your brand message and voice and is for your exclusive use. Licensed video helps you publish more frequently, at a fraction of the cost of producing it all from scratch since the content is already created and ready to use. Ready-to-use, produced video in English and French from CP, AP and other partners, covering national and world news, business, sports, entertainment, health, automotive and more. Raw footage straight from the camera of entire interviews or short cuts featuring a newsmaker speaking, for example. With 70-plus freelance videographers across Canada and access to AP's global network of more than 150 freelance videographers, clients count us to meet their needs for specific locations or tight timelines and budgets. From planning and filming to editing and media distribution, we simplify video production and create stories that engage and evoke emotion with your audience. Ready to use video to tell amazing, authentic stories that drive results? A free trial of our licensed video and a consultation about your branded content needs.